Maria Gaspar discusses her recent project, “Radioactive: Stories from Beyond the Wall,” which culminated in a public site intervention at the Cook County Jail this past fall. 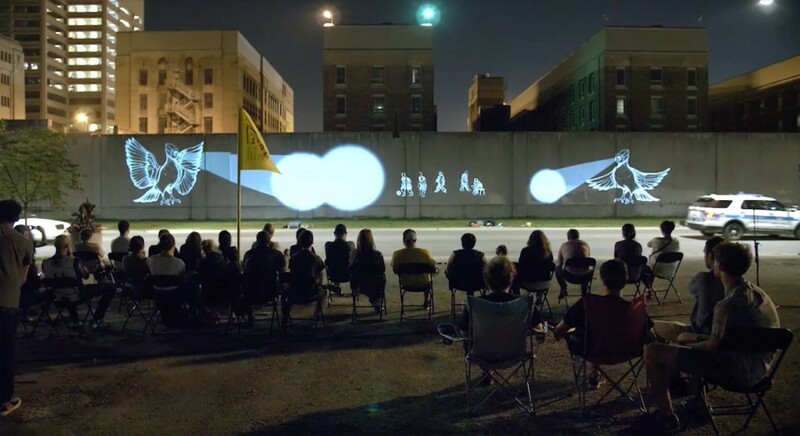 At the intervention, Gaspar illuminated the north end wall of the jail with projected animations developed through workshops she held inside the jail with men who were incarcerated, collectively named the Radioactive Ensemble. Original audio recordings were broadcast on site, through the wall, and across the city. “Speech Acts” references the power of sound as a force and form and the strategy of fictive narration as liberatory and subversive. Gaspar traces how she instigates body, site, and sound in her ongoing individual and collective artistic practice. Maria Gaspar is an interdisciplinary artist negotiating the politics of location through installation, sculpture, sound, and performance. Gaspar’s work addresses issues of spatial justice in order to amplify, mobilize, or divert structures of power through individual and collective gestures. Her practice situates itself within historically marginalized sites and spans multiple formats, scales, and durations in order to generate liberatory actions. Gallery 400 is located on the first level of the Art & Exhibition Hall building with a push-button accessible door and can be accessed by a set of stairs with a railing or an elevator (Level 1R). We will post updates about the status of the elevator on the Gallery 400 Facebook page and the Facebook Event page. There are two all-gender restrooms located on the same floor as Gallery 400. While the restrooms are accessible to wheelchair users, the door to the restroom is not. Visitors who use wheelchairs can request personal assistance with opening and closing the restroom doors by asking any Gallery 400 staff member. The entrance to the building is located in a turn-around where visitors may be dropped off right outside the main door. The closest UIC public parking lot is the Harrison Street Parking Structure. Further information regarding parking on campus can be found at UIC Parking Services. Motorist assistance is available 24 hours a day, 7 days a week, by calling (312) 355-0555. Gallery staff can provide chairs in the gallery space upon request. The front desk attendant is trained in Personal Assistance and can provide audio description, large text labels, and transcriptions. Other accessibility services are available upon request and may be arranged by contacting the gallery at (312) 996-6114 or emailing Megan at gallery400engagement@gmail.com.